Press Release courtesy of Sarah Otteman, Pepperdine Athletics. The 4th-annual Beach Volleyball Fun-D-Raiser, featuring a 4-on-4 tournament at Zuma Beach, is scheduled for Saturday, October 21, announced head coach Nina Matthies on Wednesday. The money raised will directly benefit the 2017 NCAA Runner-up and two-time AVCA national championship-winning Pepperdine beach volleyball team. Participants in the 4-on-4 tournament are asked to arrive at Zuma Beach, near the east end of the beach in between lifeguard towers two and three, at8:30 a.m. for registration and team draws. Play will begin at 9 a.m. and the minimum entrance donation is $100. Donations will be gift receipted by the University for tax purposes. It is advised that participants and spectators bring their own water, beach chairs, umbrellas, sunblock, etc. Due to NCAA rules, high school aged players – male or female – will not be able to participate. All other age groups, as well as all skill levels, are welcome. The Waves have been at the forefront of the sport of beach volleyball since it began in the spring of 2012. Now with six seasons in the books, Pepperdine has emerged one of the most dominant programs with two AVCA national team titles and a most recent trip to the NCAA Championship final match in 2017. The Waves have a nation-leading 18 AVCA All-Americans. 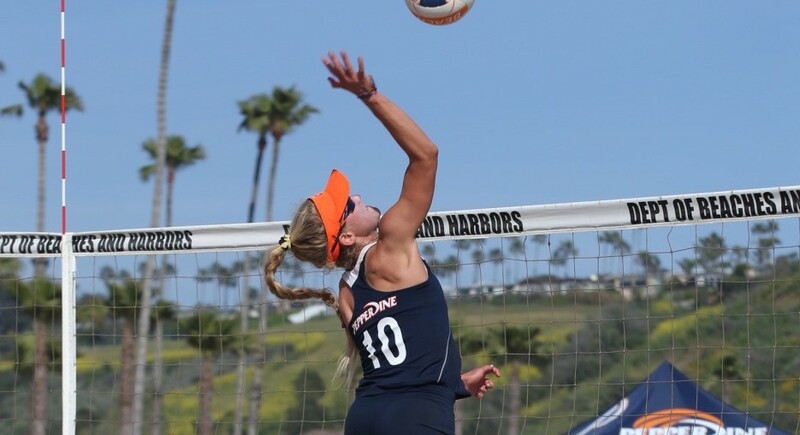 All funds raised support the ongoing development of the Pepperdine beach volleyball team. Money will go towards team travel, equipment and other team-related expenses. Follow @WavesBeachVB for updates and check on PepperdineWaves.com for full results, recaps and more!